After having the same coach and defensive style of play for 13 seasons, the Ohio Bobcats underwent a change in not only leadership, but also identity last season. Aaron Rodgers, a former assistant coach at Kentucky, was tasked with changing the culture of the Ohio soccer program. Rodgers wanted Ohio to keep as much possession of the ball as possible, while also creating chances and turning those opportunities into goals. He had some success doing that, with the team scoring 26 times last season, but the Bobcats — for the second straight season — lost in the MAC Tournament quarterfinals to finish last season at 7-8-5. As the Bobcats prepare for the 2014 season without the services of graduated seniors Mattie Liston, Maggie Murnane, Natalie Bechtel and Alex Stec, Rodgers is confident that the team will continue to grasp his concepts and philosophy. Ohio has two big questions it must answer in a relatively short amount of time: First, how does the team replace the production of striker Holly Harris? 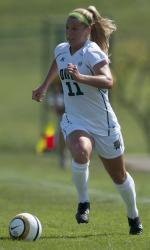 Harris tore her ACL in the team’s final spring season game against Malone on April 12, but Rodgers is not short of attacking options. He can call on the likes of second-year striker Alli Cislo, wingers Carly Manso and Liz Finley, and Sasha Haverchak, who battled injury last season. Second, who will be Ohio’s starting goalkeeper when the season starts Friday? Liston gave Ohio four years of stability at the position, but with her no longer in Athens, Nicole Amari and Rachel Fryan are the top two candidates to take over for Liston. Rodgers said Amari is the favorite to land the gig, but he thinks he has enough depth at the position. Rodgers will be counting on four players to lead the team from the middle of the field. Center backs Gabby Hausfeld and Grace Campbell, and midfielders Annie Beard and Leah Sandercock will have to start the attack and contain opponents from creating chances and scoring goals. Hausfeld, a native of Cincinnati, Ohio, is one of the team captains for Ohio this season. She admits that there will be some pressure put on her to lead the team, but she wants the team to perform as best as it can. One player who had an extremely effective freshman season was forward Lexi Milesky. Milesky, a native of Plain City, Ohio, scored four goals and dished out three assists en route to a MAC All-Freshman Team selection. Rodgers is excited to see what Milesky will do for an encore. Hausfeld thinks the team will have a second consecutive season where freshmen will make a valuable impact. Midfielder Megan Niebuhr and forwards Kelley Zebrowski and Allie Curry are just a few of the freshmen who will see significant time on the field this season. “They (the freshmen) will make quite the difference for us this season,” Hausfeld said. The nonconference schedule for the Bobcats will provide the team with a challenge. Ohio will play its first four games away from Chessa Field, which includes a game against Kentucky on Aug. 31. Notable teams that will travel to Ohio are Xavier and Detroit. Rodgers is hoping to eventually win the MAC regular season and tournament titles, but before the Bobcats can think about winning both of those titles, they’ll have to keep showing improvement in every area of the field.